Albedo is the fraction of the sun’s radiation reflected from a surface. It is quantified as the proportion or percentage of solar radiation of all wavelengths reflected by a body or surface to the amount incident upon it. An ideal white body has an albedo of 100% and an ideal black body is 0%. Albedo enhancement attempts to increase the reflectiveness of clouds, land surfaces, and water so that an increased quantity of the sun’s heat is reflected back into space, ergo albedo enhancement is considered a form of solar radiation management [SRM]. Budikova, D. (2013). Albedo. The Encyclopedia of Earth. Peter Irvine, D. J. (2011). 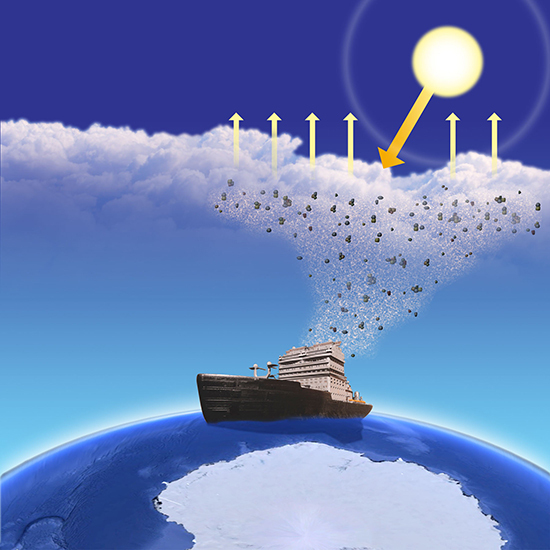 Climatic effects of surface albedo geoengineering. Journal of Geophysical Research: Atmospheres.